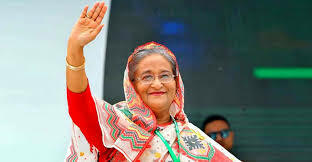 Dhaka: Sheikh Hasina, Awami League President will take oath as Prime Minister of Bangladesh today for the third consecutive term. Earlier she was the Prime Minister from 1996 to 2001. A 47-member Council of Ministers including 31 new faces, will also be sworn in. President Mohammad Abdul Hamid will administer the oath of office to the Ministers at Bangabhaban in the afternoon. Awami League and its allies secured 288 seats out of elections held for 299-member Parliament recently. This will be the fourth government under the seventy-one-year-old leader, and third in a row, since January 2009.